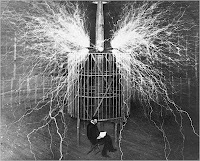 In 1893 at the Chicago World Fair, Nikola Tesla stunned audiences by letting electricity pass through him, creating lightning bolts from his finger tips. David Blaine is using Tesla Coils more than a hundred years later creating the same shocking effect, but is it really a trick? This is Tesla just reading a good book, now that is stunning!